Only an hour away from Crested Butte, Black Canyon of the Gunnison National Park has world-class climbing, great fishing and beautiful hiking in one of Western Colorado’s unique treasures. Black Canyon of the Gunnison National Park is one of the Crested Butte area’s most unique geological features. Excellent multi-pitch rock climbing routes can be found along the canyon walls. Hiking trails explore the canyon rim, with undeveloped routes leading more adventurous souls deep into the canyon’s depths. This stretch of the Gunnison River been designated Gold Medal Trout Waters for the trout fishing that can be found. Located an hour south of Crested Butte along US-50. Drawing its name from the shadows that the near-vertical walls cast down to the canyon floor, the Black Canyon stretches along 13 miles of the Gunnison River, dropping over 2,000 feet from the Canyon’s rim before it reaches the shaded water flowing below. The Black Canyon of the Gunnison is geographically divided into the North and South rims, with the South Rim being the more developed and visited of the two (the South Rim is where you can find the Park Visitor Center and most of the developed trails). The North Rim offers a more remote get-away spot for those looking to avoid crowds, as well as some longer hikes, such as the seven-mile (round-trip) hike to the top of Green Mountain. The Black Canyon has two main campgrounds – one on each rim. The North Rim Campground, which closes during the winter, has 13 sites. The South Rim Campground has 88 campsites, including sites with electrical hookups. All sites are $12/night except for sites with hookups, which are $18/night. Backcountry camping is allowed in the Black Canyon. One of the most popular features of the Black Canyon is a seven-mile drive that winds its way along the South Rim. With 12 overlooks and the South Rim Visitor Center, plan on spending at least a few hours for this drive. The North Rim drive is less developed, but the steeper walls provide some stunning views deep into the Canyon. There are a number of hiking trails on both the North and South Rims of the Black Canyon, most of which explore the edge of the Black Canyon and offer overlooks of the river and Canyon bottom below. Favorites include the Oak Flat Loop and the North Vista Trail (detailed below). The Oak Flat Loop (2 miles, begins at the South Rim Visitor Center) is a good trail for those interested in getting a taste of what the Black Canyon is like below the upper rim. From the Visitor Center, the trail winds its way to a rocky overlook and drops down through mixed forest before returning to the Canyon’s rim. The North Vista Trail (3-7 miles, begins at the North Rim Ranger Station) is a longer, more difficult trail (moderate to strenuous, depending on your turn-around point) that climbs through sage and pinyon forest past a number of overlooks before reaching Exclamation Point. The trail continues on from Exclamation Point to the top of Green Mountain, which has uninterrupted views of the San Juans, Uncompahgre and the Black Canyon. There are no maintained trails leading down to the inner part of the Black Canyon; anyone attempting to hike down to the inner canyon should be in good shape and an experienced route-finder. If you decide to explore the inner canyon, The Gunnison Route is a popular route down. The tall, vertical walls of the Black Canyon offer exciting opportunities for multi-pitch rock climbing, although climbers should be aware that it is not an area for beginners and that many of the climbs require a rappel to the base of the climb, making them very committing. For information on specific routes, check in at one of the local gear shops or consult a climbing guide. In the winter, the South Rim Road remains unplowed, and skiers and snowshoers enjoy making their way along the Canyon rim. The inner canyon is seldom ventured into during the winter. Horseback Riding – There is only one trail open to horses in the Black Canyon, the Deadhorse Trail on the North Rim. Ranger Programs – Check at the Visitor Center for information on current Ranger-led Programs. Wildlife Watching – Many plants and animals call the plethora of ecosystems in the Black Canyon home. Visitors may find signs of marmots, coyotes, badgers, black bears, porcupines, various raptors (including the fastest bird on the planet, the peregrine falcon) and great horned owls. Kayaking – Although the Gunnison River is not raftable through the Black Canyon, expert kayakers looking for a challenging river do attempt it. Do not attempt to kayak this section of the Gunnison unless you are a very experienced kayaker and have checked the current water levels. Black Canyon National Park is just under an hour south of Crested Butte, along US-50. To get there, take CO-135 south to Gunnison, then take US-50 15 miles west. For more information about the Park, contact the park headquarters by phone (970-641-2337). If you come during the summer months, expect temperatures up to 100o F and as low as 30o F. During the winter, temperatures rise into the low 40s and can drop well below 0o F at night. Water is available from mid-May to mid-October. The North Rim Campground is closed during the winter months. The South Rim Campground remains open all year, although part of the campground closes during the winter. 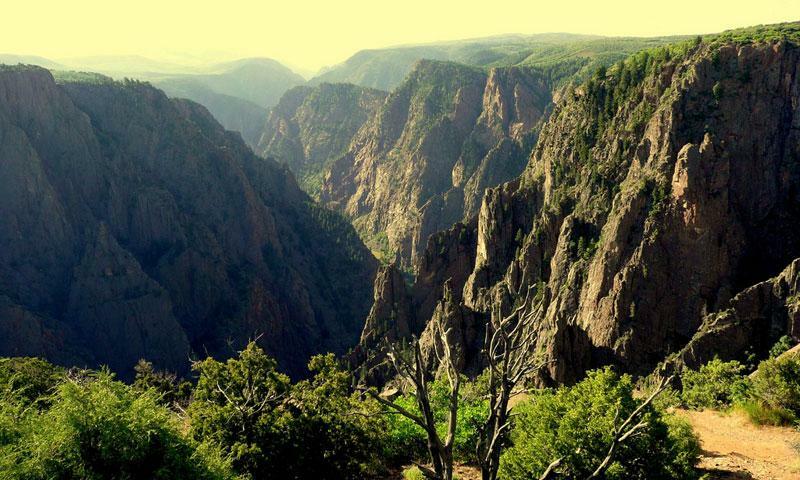 A seven-day pass for the Black Canyon is $15/vehicle or $7/hikers, biker or motorcycle. An annual pass is available for $30. The Black Canyon Land Trust strives to protect and conserve that natural land that surrounds Montrose. Include Rocky Mountain National Park in this year's vacation plans! Visit the caverns at Glenwood Springs, Colorado.